Everyone knows pesto, the bright-green basil and pine nut sauce from the Liguria region of Italy. But what many don't realize is that pesto comes from the word for "crushed" in Italian—as in, crushed to a paste with a mortar and pestle—and there are other pesto sauces out there. The second most famous pesto sauce in Italy? It's arguably pesto alla trapanese, the version made in the Sicilian city of Trapani. It has a lot in common with the Ligurian pesto—it's rich with nuts, basil, olive oil, garlic, and cheese. But the nuts are almonds, not pine nuts, and there's an additional ingredient that transforms the sauce into something even lighter and more refreshing: tomatoes. It's quite possible that the similarities between the deep-green pesto of Liguria and this creamy Sicilian one with a pinkish tinge aren't accidental. Most accounts claim that centuries ago, sailors from Genoa, the capital city of Liguria, would stop in port cities like Trapani during their voyages, and share their recipes while there. The sauces indeed have enough in common to make this story more than plausible. But it's still important to remember that sauces pounded with a mortar and pestle predate recorded history, so there's a good chance the Sicilians were already making something at least somewhat similar before the sailors of Genoa ever landed there. After all, they had the garlic, the cheese, the basil, and the almonds; surely those ingredients had been pounded together in some combination at one point or another. Once tomatoes arrived from the New World in the late 15th century, it was only natural they'd get tossed into the mortar as well. Like Genoese pesto, pesto alla trapanese is a fresh pasta sauce, and you want to keep it that way. That means that instead of finishing the pasta in the sauce over heat, as we do with most pasta dishes, these pestos need to be tossed with the pasta (and some of the starchy pasta water) off the heat. This coats the pasta in the sauce and forms a creamy emulsion, but avoids giving it a cooked flavor. As mentioned above, this sauce is traditionally made using a mortar and pestle, and, as my own pesto tests have shown, that really is the superior tool to use for such sauces—crushing the ingredients, instead of chopping them, creates a sauce with better texture and flavor. That's the ideal, but, of course, our lives don't always allow for that. Sometimes we're short on time. Sometimes we're tired. Sometimes our arm is in a cast for six weeks (or maybe that's just me?). When we can't put in the elbow grease, blitzing everything in a food processor is just fine. 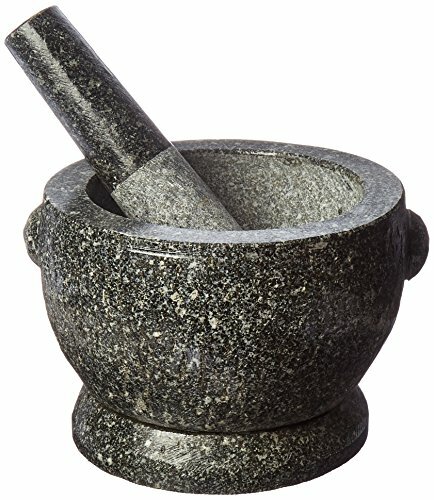 When working with a mortar and pestle, the goal is to crush everything up, mashing the garlic, almonds, and basil to a paste. The almonds should be blanched, meaning their skins should be removed. You can buy already-blanched almonds and save yourself the trouble, or you can blanch them yourself at home. It's an easy process that involves soaking the nuts for a few minutes in boiling water, then slipping off the skins. If you can find them, Sicilian almonds, such as the pizzuta d'Avola variety, are a great choice here. They have a more bitter and intense, fruity, cherry-pit flavor that lends a lot more character to the sauce. Once the base paste is made, you can begin to pound in the basil leaves. Almost every recipe I've seen, including many from Italian and Sicilian sources, call for basil, with the option of tossing in a mint leaf or two (either directly in the paste or as a garnish on top of the pasta). Strangely, Marcella Hazan, in her book Marcella Says..., writes that the correct herb in Trapanese pesto is mint, but she is the only source I've been able to find, in either English or Italian, to claim this. I'm sticking with basil (with a couple optional mint leaves tossed in), since that's what everyone else uses, but if you want to try the sauce as she does, entirely with mint, there's no harm in playing around. After that, in go the tomatoes, which should be peeled and seeded first. The flesh alone adds quite a bit of moisture to the sauce, so seeds would make it downright watery. To finish the sauce, work in some olive oil and grated cheese. The cheese is traditionally a pecorino, but Pecorino Romano is really too salty and spicy for this sauce. Since that's the most commonly available pecorino cheese, your next best option is to use a 50/50 blend of Romano and Parmigiano-Reggiano, the latter of which will help soften the pecorino's sharp edges. To finish, cook the pasta, then toss it into a large serving bowl with most of the sauce, adding some of the starchy pasta water to help emulsify everything and prevent it from becoming too dry. You can always hit the pasta with more olive oil and fresh cheese, plus another spoonful or two of sauce on top. To be honest, between the classic Ligurian pesto and this one, I'd pick Trapanese pesto any day. It has all the same herbal and nutty flavors, but they're tempered by the fresh and fruity tomato. This is my ideal summertime pesto, and maybe this summer it'll become yours, too.